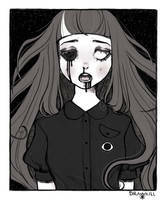 My Goretober 2018 is back up in my shop! Get them while they last! Very nice display of viscera! You're showing a little more than skin. I can't get over how cool this is! You seamlessly worked eyes into many of the drawing's aspects. The texture on the hair and sleeves is beautiful, and I really love how the red blood contrasts with the blacks and whites! Wow! 0-0 That's like, really good. Like wow! Your art style is gorgeous too btw! Have a lovely day!